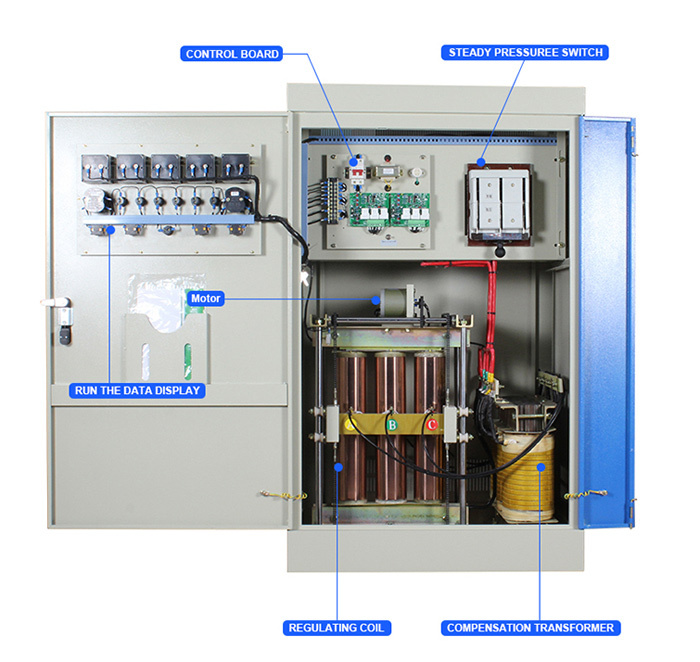 ATO energy-saving 250 kVA capacity 3 phase 4-line industrial voltage stabilizer is a air cooled full automatic compensated stabilizer with input voltage range of 304V-456V AC and out voltage of 380V, has the functions of over/under-voltage protection, delay and error protection. 200 kVA 3 phase Industrial AC Automatic Voltage Stabilizer is highly beneficial when the electricity supply to the site is at a higher or lower voltage level than needed. This system stabilizes the input voltage to be stable and generates a reliable output voltage to the residential, commercial, industrial site. Therefore, it can achieve energy saving and electricity bill reduction by decreasing power consumption.